message sent to either yourself or your recipient. No shipping charge! 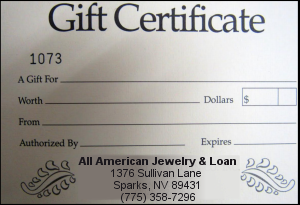 You will be given the opportunity to enter the Gift Certificate amount you wish to purchase during check out. Please remember, you can purchase gift certificates in any denomination ABOVE $5.